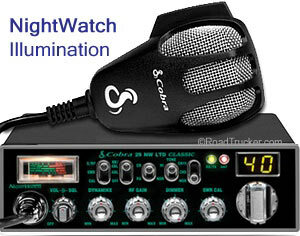 The Cobra 29 NW adds NightWatch illumination to the 29LTDCLASSIC, enhancing safety and convenience for professional drivers. This backlights the radio's function settings for easy viewing at night while minimizing eye fatigue. 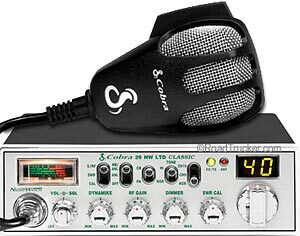 Professional driver features are instant access to channel 19, RF Gain, Dynamic microphone gain for Loud and Clear communication. Built-in SWR Calibration with warning indicator to adjust and monitor the antenna system. Use in your pick-up truck or semi-truck and keep rolling at night because the 29NWLTD is safe and easy to use in the dark.